Drew Pyne’s previous visits to Notre Dame have been pretty busy. 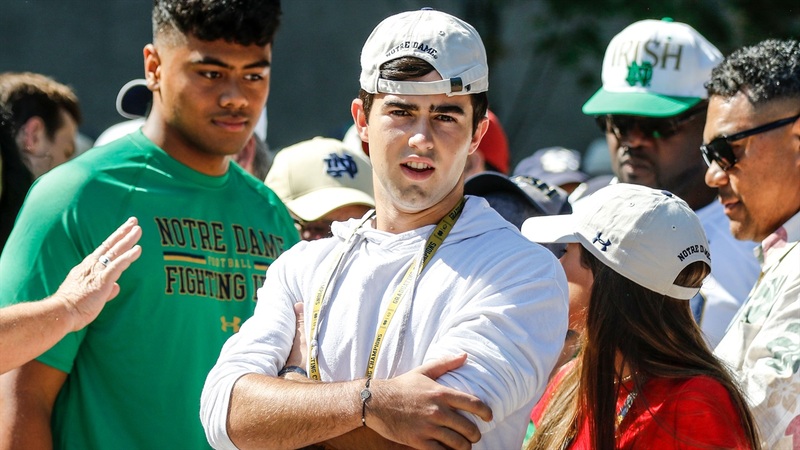 The 2020 Irish quarterback commit was in South Bend last April as an uncommitted prospect, but would announce his pledge just days later. “Obviously, it was a little tense because I was making my decision,” the Connecticut native explained. He was back in town for September for a game and that was another hectic atmosphere. So, Pyne is looking forward to relaxing at his future home when he returns this weekend. “I’m just going to try to enjoy myself,” the New Canaan High School star said. Pyne doesn’t know exactly what quarterbacks coach Tom Rees and offensive coordinator Chip Long have in store, but he’d welcome the chance to get up on the board and draw some X’s and O’s. Pyne has been an aggressive recruiter for the Irish since committing. He said he “definitely” plans on getting after it this weekend with some uncommitted prospects also set to visit. “Tosh Baker is going to be there and I’m going to meet some other kids there,” said Pyne, referring to the 2020 Arizona offensive lineman, who is a top target for the Irish. 2020 California defensive end Ben Yurosek and 2020 New York athlete Cullen Coleman will also be in town and Pyne has already been in touch with both.